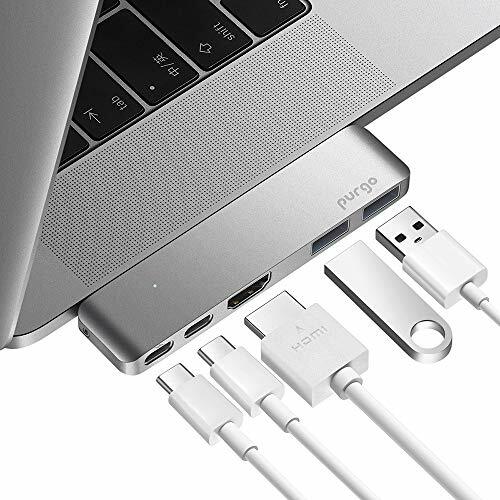 The Purgo Slim Aluminum Thunderbolt 3 Hub, USB C Dongle is the newest addition to our USB-C product collection and the perfect companion for your 2016/2017 MacBook Pro. The most compact and fastest (50Gbps) hub features 4K HDMI video output, a thunderbolt 3 port, a USB-C port and 2 USB 3.1 ports. Simply, plug and play to expand your MacBook's capabilities. Specially designed for 2016 and 2017 MacBook Pro - including 13" and 15". It is convenient to extending a second display or mirroring your MacBook Pro to a projector. Support USB 3.1 Gen1 5Gb/s data speed, compatible with USB 2.0/1.1, Plug & Play. The sleek, minimalist design with an aluminum-alloy finish perfectly complements the late 2016/2017 MacBook Pro. 18 months manufacturer warranty, professional and friendly customer service! Not recommended for use with a laptop case. Ultra Slim USB Type C Hub Specifically Designed for 2016/2017 MacBook Pro - including 13" and 15"
Plug & Play, Mac-Style Design - Perfect companion for your MacBook Pro to enhance productivity. If you have any questions about this product by Purgo, contact us by completing and submitting the form below. If you are looking for a specif part number, please include it with your message.